"Another day has just broken in Liberia's capital, Monrovia. Outside a block of humble flats on Centre Street, two women in long overcoats jump out of a taxi, avoiding the torrents of rainwater pouring along the gutter as they carry a large plastic bucket. On the porch, a crowd of young homeless men take shelter. They are about to receive a lesson in handwashing, non-contact and recognising symptoms of the deadly Ebola virus. It has killed 249 of their countrymen so far since March, 961 worldwide, and prompted 1,779 reported cases internationally. 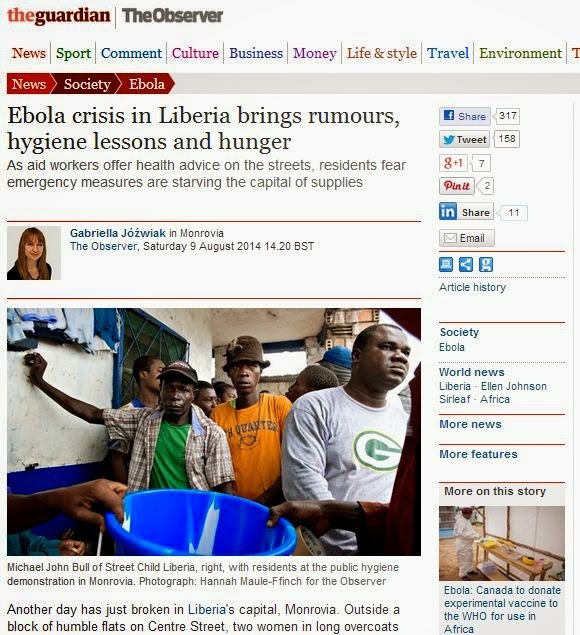 "The fact that Ebola is spread through bodily fluids such as sweat and saliva means that reducing physical contact has become a national obsession..."
Read the article in full on the Observer and Guardian Website.